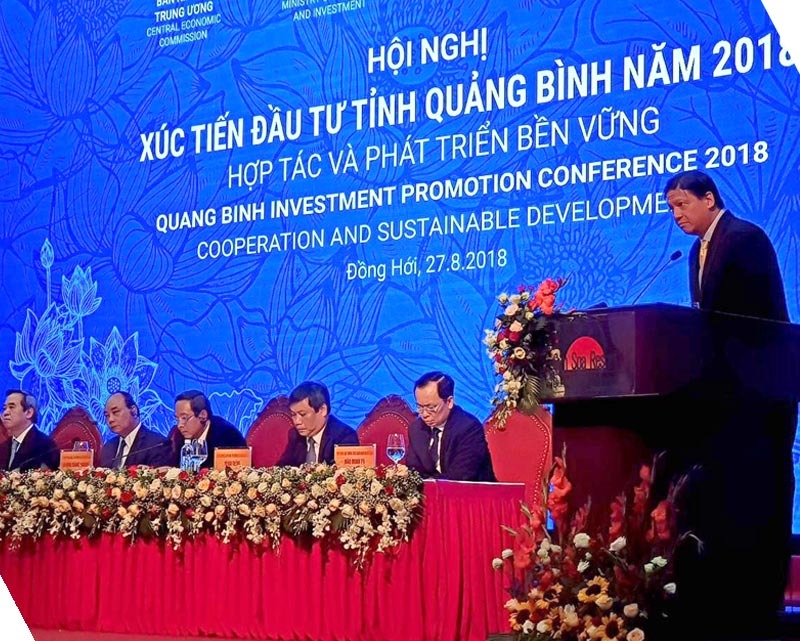 AC Energy President and CEO Eric Francia delivers his speech at the Quang Binh Investment Promotion Conference 2018. The conference was attended by potential and existing Quang Binh investors, with His Excellency Nguyen Xuan Phuc, Prime Minister of the Socialist Republic of Vietnam (2nd from left) as the guest of honor. 27 Aug 2018 | Dong Hoi, Vietnam — AC Energy President and CEO Eric Francia expressed his appreciation of Vietnam governments’ strong support for renewables and signified the company’s intent to participate in the country’s clean energy sector in a significant way. Speaking at the Quang Binh Investment Promotion Conference 2018, Francia talked about AC Energy’s plans of scaling up its renewable energy platform both in the Philippines and International, which includes a pipeline of RE projects in Vietnam. The company aims to exceed 5 GW of attributable capacity by 2025. In June, AC Energy signed a memorandum of understanding with the Quang Binh Province to develop a wind power project in the province through New Energy Investments, a joint venture with local partner AMI Renewables. “We believe that Vietnam’s economy will continue to grow significantly in the coming years, and the country will need more sustainable energy. We look forward to being a reliable partner and contributor in harnessing Vietnam’s strong potential in renewable energy,” Francia said.